Hollywood superstar Burt Reynolds, best known for movies Smokey and the Bandit, Deliverance & Boogie Nights, has died aged 82. He suffered a cardiac arrest in Florida. Reynolds had been battling health issues the past years. In 2013, the actor’s rep said he was in intensive care in a Florida hospital for treatment of flu symptoms, including dehydration. “My uncle was not just a movie icon; he was a generous, passionate and sensitive man who was dedicated to his family, friends, fans and acting students,” Reynolds’ niece, Nancy Lee Hess, said in a statement. At the peak of his career, Reynolds was one of the most bankable actors in the film industry, reeling off a series of box office smashes until a career downturn in the mid-1980s. He starred in dozens of films, also including Deliverance (1972), White Lightning (1973), WW and the Dixie Dancekings (1975), Hustle (1975), Nickelodeon (1976) and Semi-Tough (1977). He was the top money-making star at the box office in an annual poll of movie exhibitors from 1978 to 1982. Many of his films were set in the South. 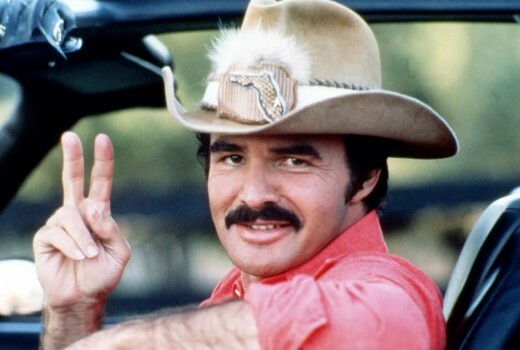 He often played a loveable rascal who outwitted local authorities, as in director Hal Needham’s 1977 crowd-pleasing action comedy Smokey and the Bandit, co-starring his girlfriend Sally Field and Jackie Gleason, and its two sequels. He rebounded in 1997 with a nomination for a best supporting actor Academy Award for Boogie Nights. His TV credits included his series Evening Shade which ran from 1990 -1994, My Name is Earl, Hope & Gloria, King of the Hill, The X-Files, Ed, Burn Notice, American Dad, Archer, Cybill, The Larry Sanders Show, and B.L. Stryker. With his trademark moustache, rugged looks and macho aura, he appeared naked — reclining on a bearskin rug with his arm strategically positioned for the sake of modesty — in a centrefold in the women’s magazine Cosmopolitan in 1972. “There are times in your life that are so indelible, they never fade away. They stay alive, even forty years later. My years with Burt never leave my mind. He will be in my history and my heart, for as long as I live. Rest, Buddy,” said Sally Field, whom he previously referred to as the love of his life. Very sad to read of Burt’s passing. Another great actor bites the dust. Rest in peace. Sad to hear. Bert’s face was everywhere in the 70s and early 80s. Don’t think he was ever thought of as a “serious” actor …rarely seemed to receive the critical acclaim some of his contemporary actors enjoyed. His first lead TV series role was ‘Hawk’ as the titular police detective-was shown on 7 in the early70s-he was a far better actor than many of his films-like a lot of Hollywood, being a star got in the way of being an actor.. RIP Sir. He was also one of the lead actors in 50 episodes of “Gunsmoke” during the early 1960s (1962-1965). He played Quint.